Into the Light will be IN-sight’s 3rd exhibition together but their first themed show. Allowed into the Stroud, Museum in the Park’s store rooms to see the collections that are not on show, IN-sight will be responding to artefacts and hidden treasures. The group will be bringing part of these collections into the light and using printmaking in its widest forms to make diverse and contemporary objects. IN-sightis a group of individual practitioners brought together by a passion for exploring and extending the possibilities and boundaries of printmaking. This creative group was formed at the University of the West of England after studying for an MA in multi-disciplinary printmaking. 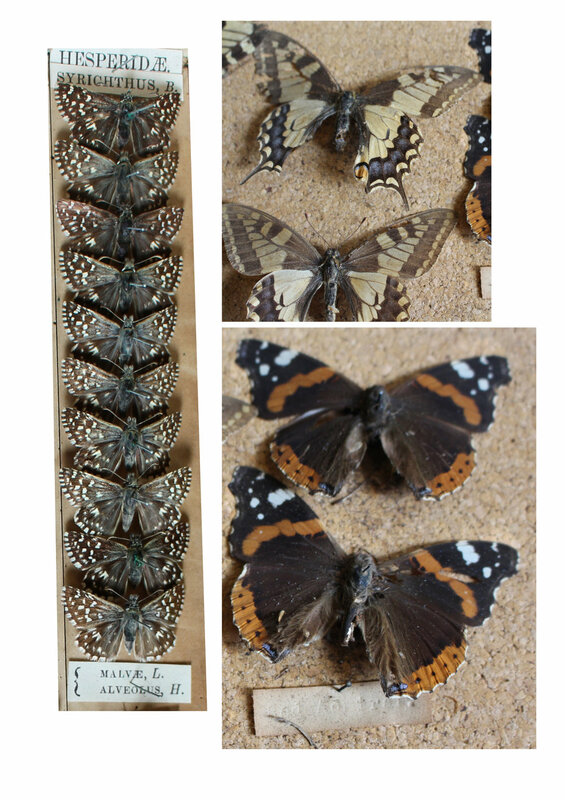 Inspired by some drawers of butterflies found in the Museums store, some of which were in better states than others, I began by researching them a little further online. I started with traced, simplified line drawings which I then live traced in Illustrator and coloured in. I decided very early on to focus on just four butterflies chosen for their differences in colour and pattern . The Swallowtail has already featured in earlier lampshade designs, so I decided to leave this one out. Particularly, as it is very rarely spotted here in Britain now and I wanted to include butterflies that my audience were more likely have seen. These red admirals have seen better days! It was pretty sad seeing how these beautiful creatures had broken apart and faded over the years. 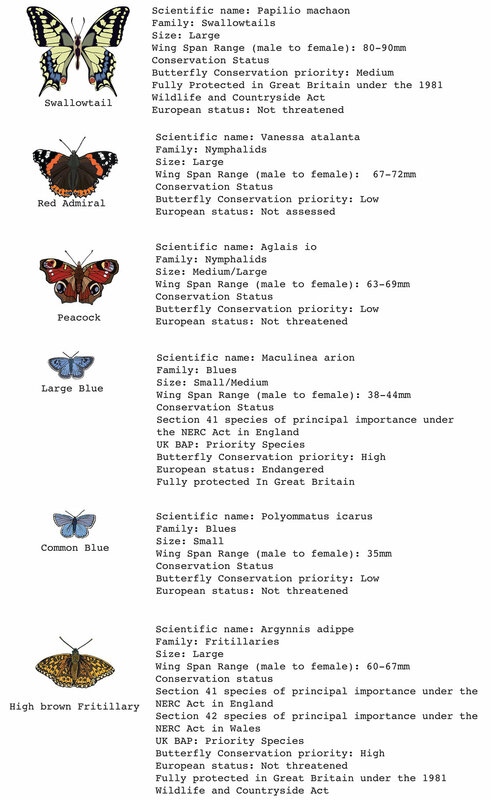 While doing my background research I came across an interesting article online called Wings of Desire from the Independent -Why the hobby of butterfly collecting is no longer and it's all about conservation now ... thank goodness as numbers and species go into decline along with other important pollinators. This was my hook of course, I'm all about pollinators, so I thought it a perfect subject for me to really tackle in my own way. 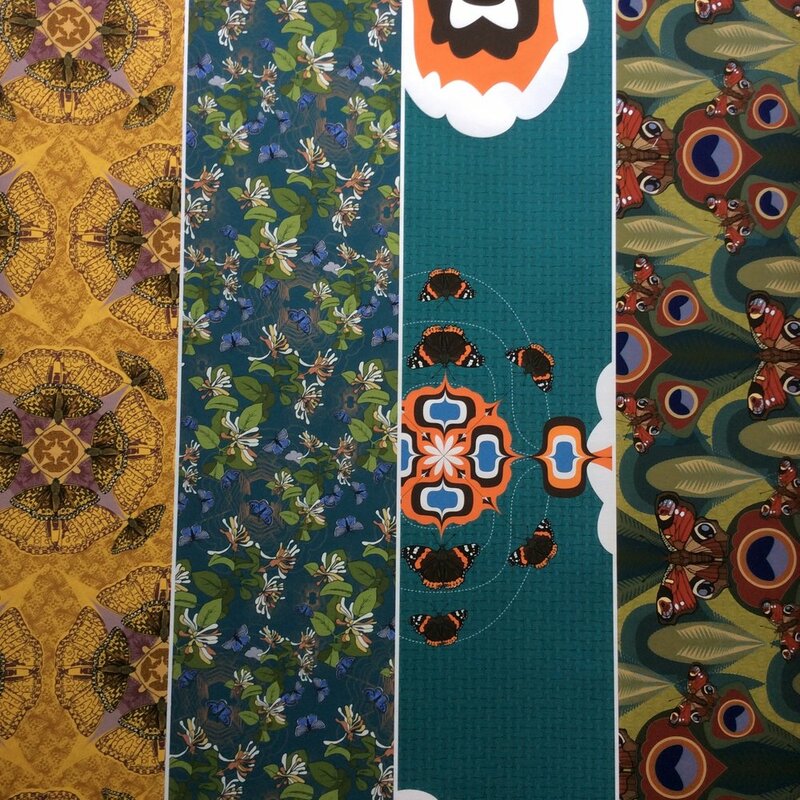 With the show in mind I have designed four new repeat patterns for my first ever wallpapers (drum roll)! I’ve also made some coordinating designs to fit lampshades alongside a new laser cut and screen printed convex mirror piece.I also wanted to create different styles of wallpaper with slightly different historical references. My Red admiral design has distinctive 1970’s connotations, as does the High brown fritillary design but my Peacock butterfly design is very Art Nouveau . The Common Blue design has a more contemporary feel. All the patterns were designed in Adobe Illustrator , my favoured design tool . I choose elements of shapes within the butterflies to make into what are called fills and backgrounds and combined them with the butterfly motifs to form the final tiles for repeat. This all took much backwards and forwarding and a few You Tube videos – I’m pretty much self taught when it comes to this part, having had no formal textile design training . I’ve just picked up what I needed to know along the way and been fortunate to have a few appropriately educated friends! I’ve had a few samples printed on removable wallpaper by Pete at Practical Solutions here in Bristol and he will be printing my 3.4mtre drops for the exhibition. However, I am now also getting samples made at a proper wallpaper manufacturers , Surface Print which is very exciting ! I’m hoping to be able to offer 10mtr rolls of all these designs for sale in the near future! I’ve also translated my designs to fit lampshades which are being printed at my usual digital printers CAT digital up in Glasgow School of Art. These will be hung next to the wallpaper and then be available to order in a variety of sizes. And then… I’m also going to be laser cutting and screen printing my largest mirror frame yet . I will be re appropriating my honeysuckle motifs from my last years design from the large Honeysuckle mirror but adding the butterflies illustrated in the wallpapers. I am expecting it to look gorgeous around the converse mirror I’ll be inserting in the middle. It’s going to be a busy September !